Buy and sell musical instruments on the Westholme Association web pages. 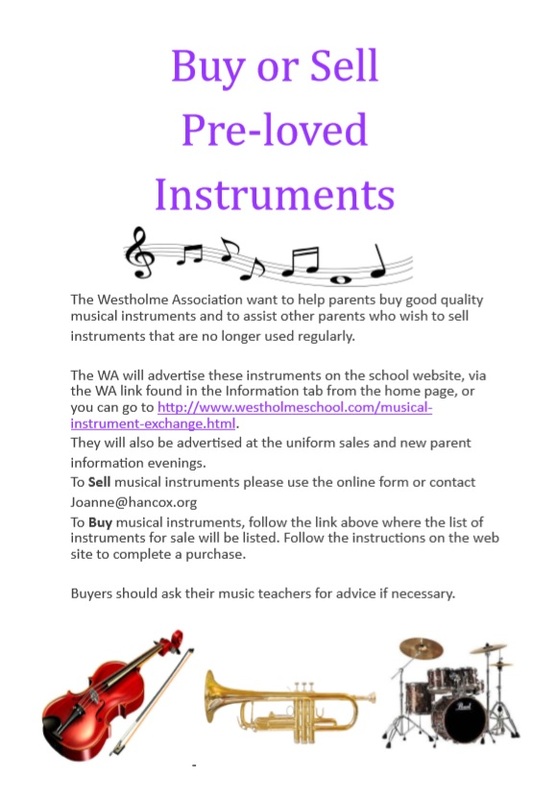 Pupil’s and ex-pupil’s parents may utilise Westholme Association web pages to buy/sell musical instruments. Adverts will remain on the website for 6 months, but may be renewed. Sellers will be sent contact details of interested parties and should make their own selling arrangements. Sellers are requested to make a contribution to Westholme Association of £5. The forms below should be used to submit details for inclusion on the website, and removal on completion of a successful sale. In the event of a successful sale, both the seller and buyer will be contacted by Joanne Hancox. Please note: Please make cheques payable to “Westholme Association” and send with completed form to school reception in an envelope marked for the attention of Joanne Hancox, Westholme Association. Westholme Association cannot accept responsibility for the suitability and condition of any instrument. Buyers should ask their music teacher for advice before purchase if necessary.